Few watch companies are able to claim a full century of uninterrupted progress and innovation. 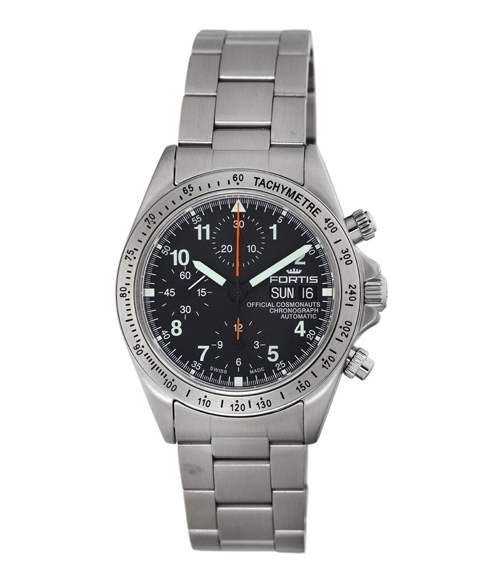 Even fewer companies can say their watches are offered as standard equipment to astronauts. 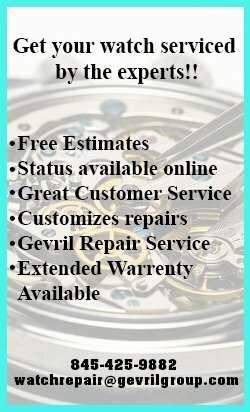 There’s only one company that can lay claim to inventing the first self-winding mechanical watch, and that company is Fortis Swiss Watches. 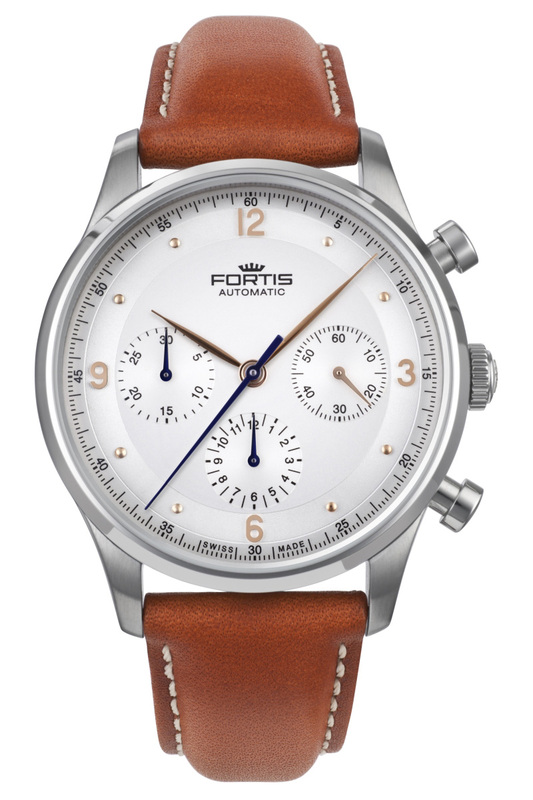 Fortis Watches celebrated its 100th anniversary in 2012, however, reflecting for too long on a century-gone-by might be unjust to a company so focused on the century at hand. Fortis, after all, recently surpassed 100,000 orbits of the earth taking part in manned space missions that began in 1994. This incredible fact is an exclamation point on how a small Swiss company from Grenchen went from local watchmaker to official supplier of interplanetary travelers. 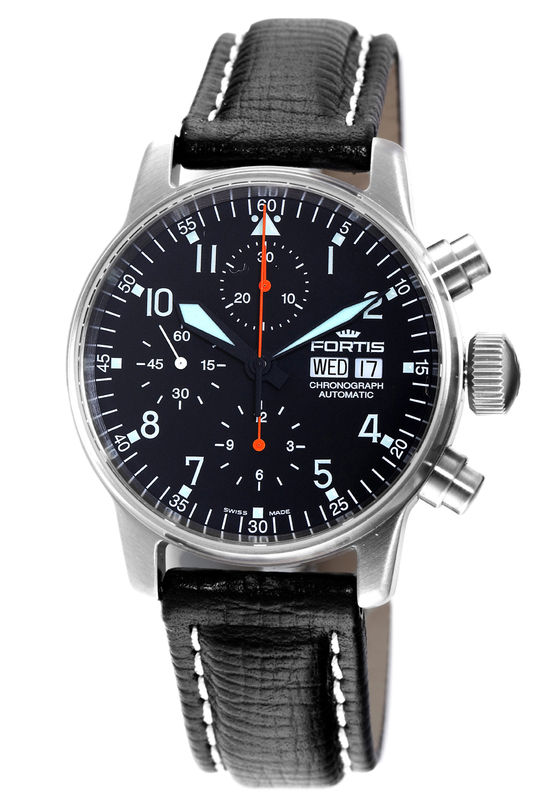 The evolution of Fortis began with the vision of its founder, Walter Vogt, whose first stroke of strategic shrewdness was locating his factory opposite the Grenchen train station, knowing full well it represented the lifeline of the modern economy. 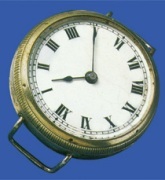 There he began commercial watch production in 1912. 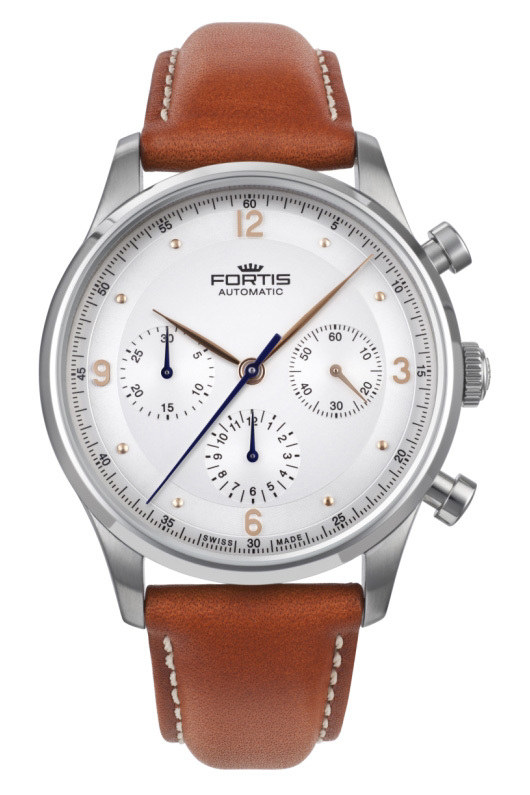 One-hundred years later, Fortis still resides at its original address. Vogt renamed the company from Vogt & Git to Fortis in 1913. 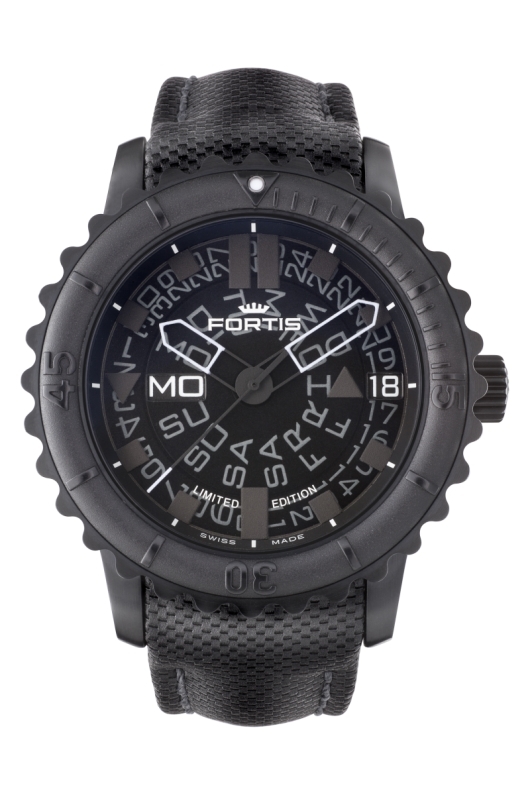 The word fortis means strong in Latin reflecting what Vogt understood would be required to operate a successful watch company — strength of foresight, strength to endure, and the strength to remain innovative yet affordable. Vogt was a futurist and although wristwatches were gaining popularity in the early part of the 20th century, and business was brisk, Vogt was on the lookout for something truly special, something on which Fortis could hang its proverbial hat. 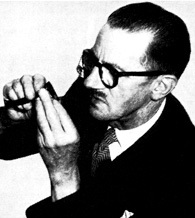 The day Vogt was waiting for came in 1922 when he met English watchmaker and inventor John Harwood. Harwood was also searching. 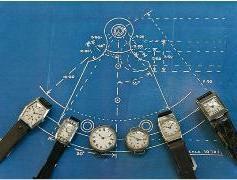 He was looking for a Swiss watch company to support his idea of creating a self-winding wristwatch. Vogt embraced Harwood’s imagination and recognized in it an opportunity to move Fortis forward. 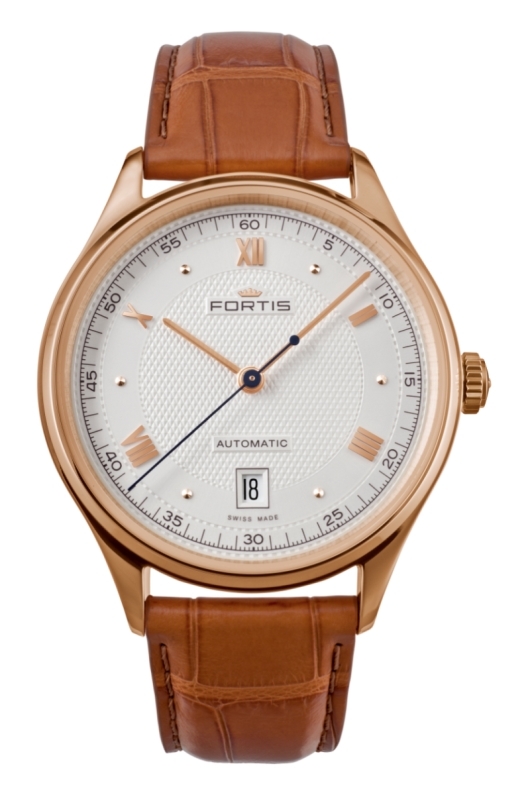 In 1926, Fortis presented the legendary Harwood Automatic to an international audience at Baselworld, and so it began. 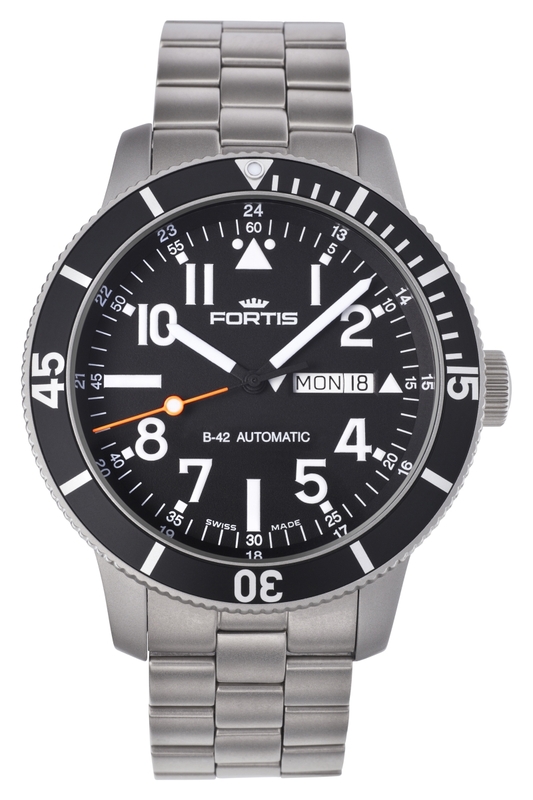 Fortis solidified its reputation as a leader in technical innovation and producer of fine watches over the next several decades. 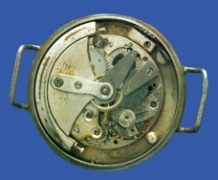 It began manufacturing chronographs in 1937 and marketed novelties such as the Rolls and another Harwood invention, the Autorist, which utilized the movement of the strap to power the watch. Fortis introduced the first waterproof Swiss watches to the world in 1943 with their popular Fortissimo models, and during the quartz watch boom of the 1970s Fortis retooled its shop to meet the new demands through the introduction of its customizable Flipper model — an international hit. 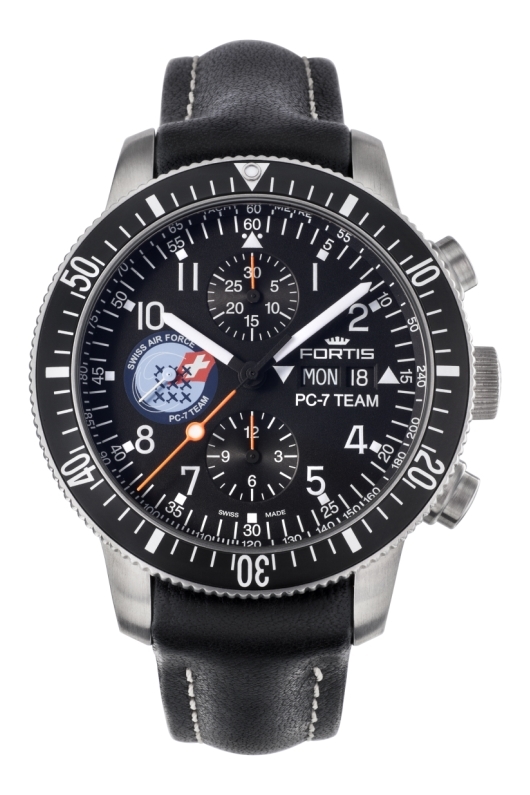 While Fortis would not set the first of its two altitude records until 1995 when Fortis chronographs were on the pilots’ wrists aboard a MiG-25PU that climbed to 100,000 feet, the ’80s were heady years for Fortis during which the brand soared. 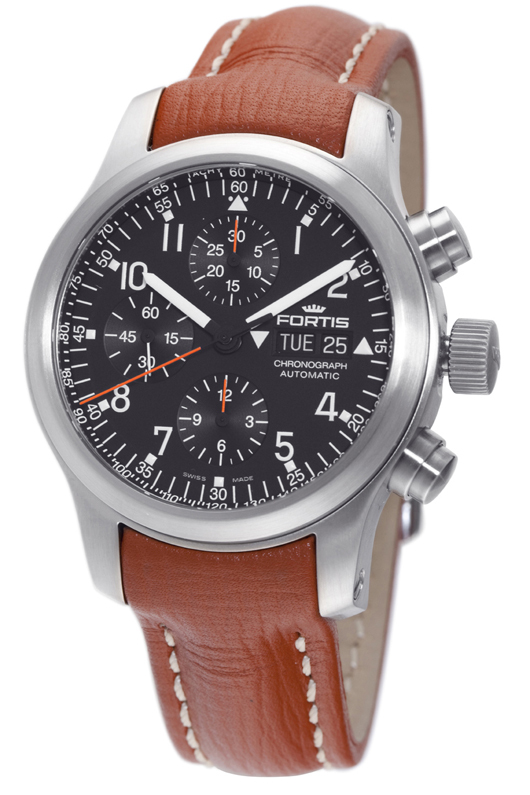 Fortis introduced its B-42 Flieger series and a new interpretation of decades-old pilot watches was born. 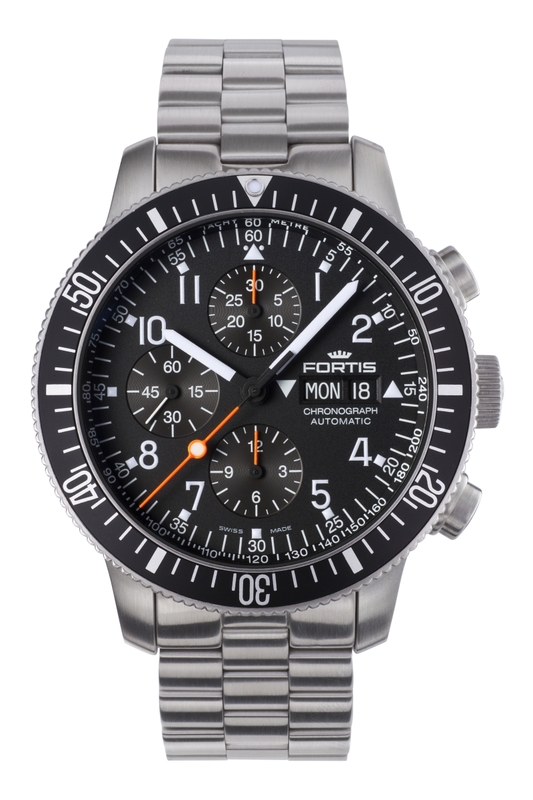 Watches such as the current Flieger Automatic Chronograph are still among the most popular and recognizable in the Fortis hangars today. Models from the current Pilot Professional collection including the Day Date Automatic and B-42 Chronograph also offer exceptional quality at reasonable costs. 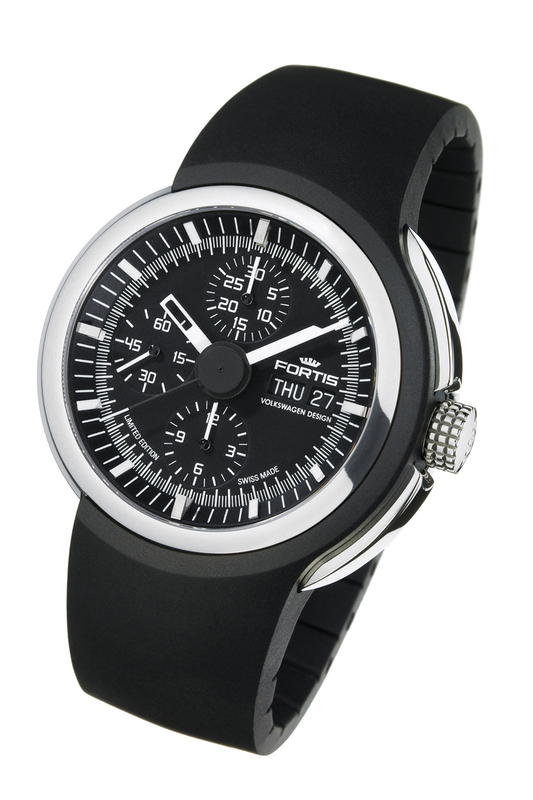 Fortis first appeared on the space scene in the early ’60s, when the durable Fortis Spacematic was chosen by astronauts in the U.S. Space Program to wear during training. 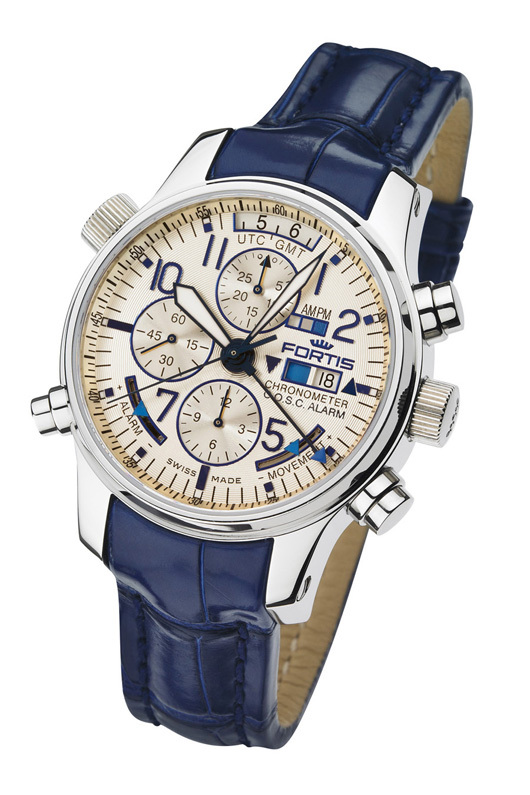 In 1994 the first Fortis watch was worn in space. 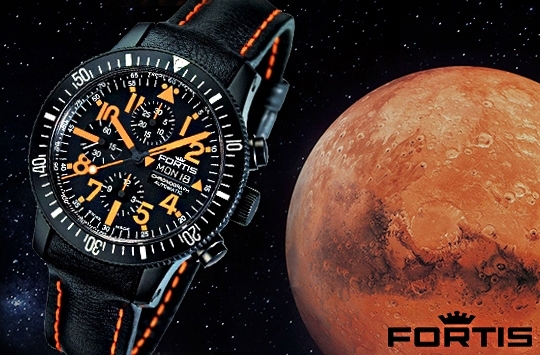 Chosen by Russia’s Star City Training Center, the Fortis Official Cosmonauts Chronograph became part of the official equipment issued to its astronauts. 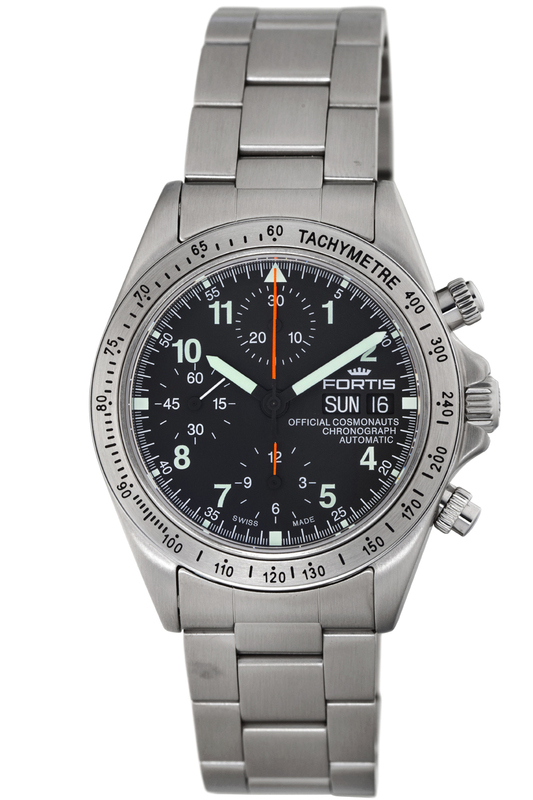 In 1997, the German Aerospace Centre selected Fortis chronographs for the German-Russian MIR 97 space mission. 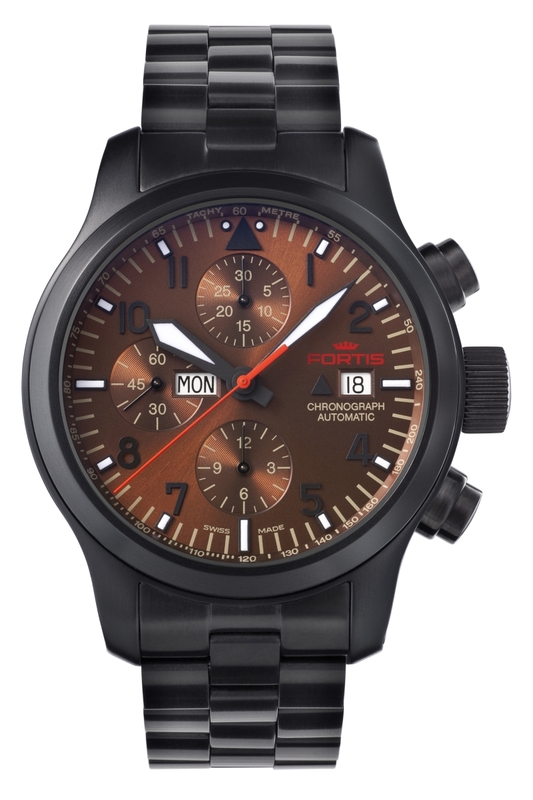 One year later, Fortis patented the world’s first automatic chronograph alarm watch, inspired by the demands of the space specialists at Star City and realized by Swiss watchmaking prodigy Paul Gerber. As part of its 2012 centennial celebrations, Fortis introduced its masterful F-43 Flieger Chronograph Alarm GMT Chronometer C.O.S.C. with dual power reserve, limited to 100 pieces worldwide. 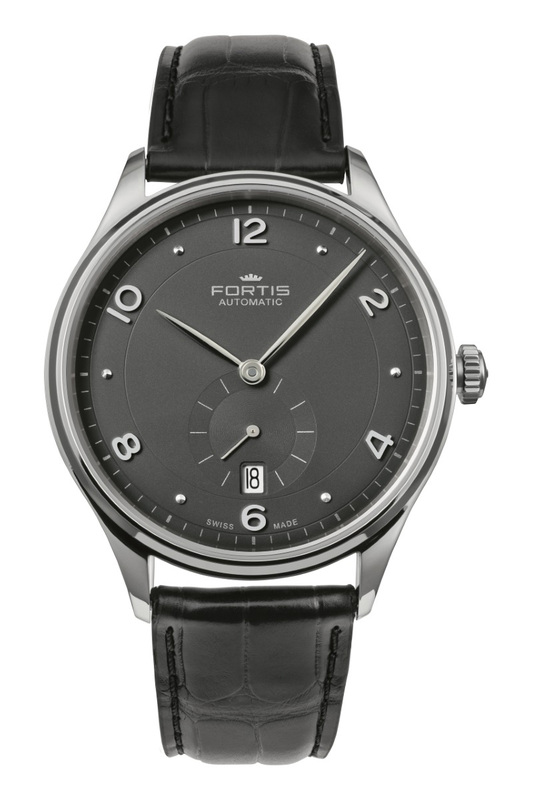 Not only is the watch the first of its kind in terms of complications, its Fortis proprietary movement represents a shift toward in-house production of more and more vital components. The limited edition B-47 Mysterious Planets was also introduced at Baselworld 2012. The jump hour complication mixes high horology with the celestial theme with which Fortis is so widely associated. 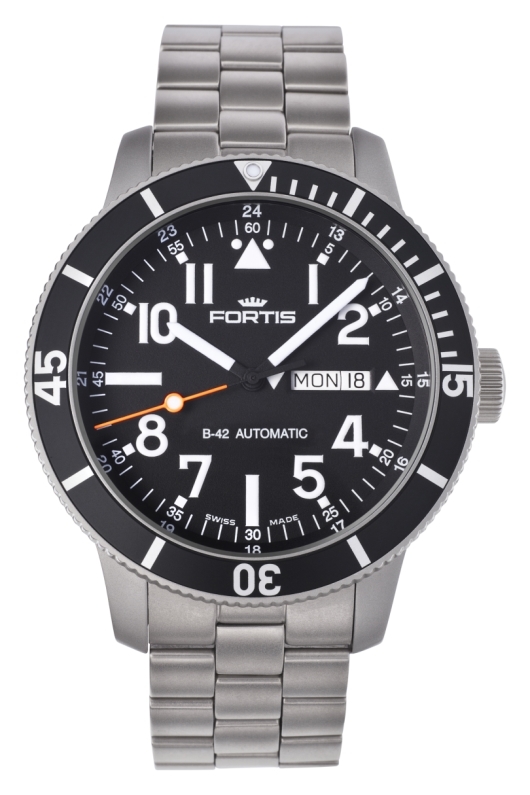 Fortis continues to blaze the trail as a leader in the development and design of pilot watches. From its enduring F-43 Flieger to the chronographs worn by Russian MiG pilots when they broke the altitude record in the 1990s, Fortis remains synonymous with advanced aeronautics. In 2012 the brand introduced the Daybreaker – the world’s first and only automatic watch with an alarm, chronograph and GMT. 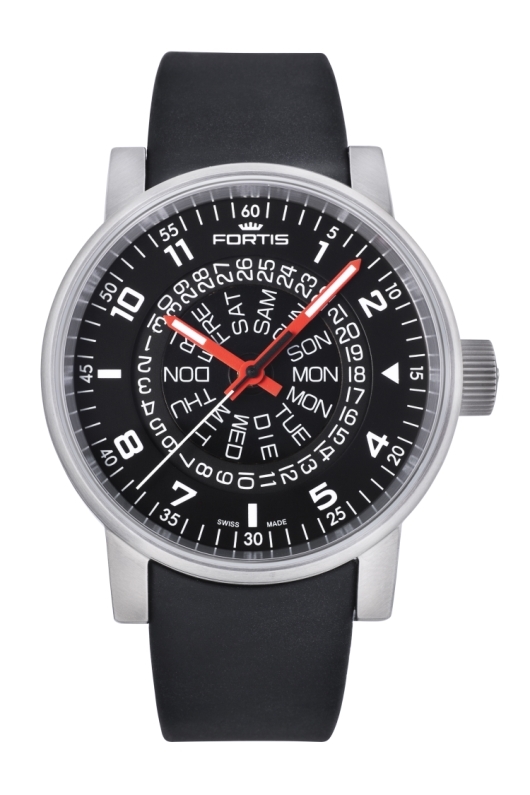 And this year Fortis launched the Aeromaster Dawn and Dusk models – fresh interpretations of a decades-old design. 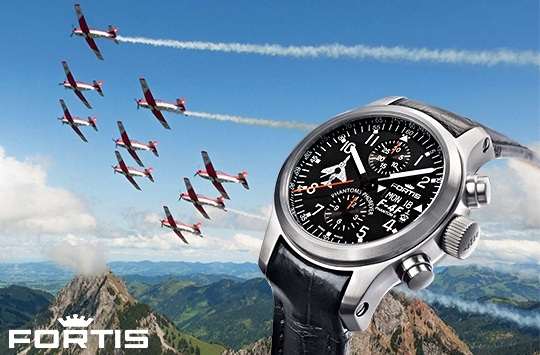 Aviatis watches are legible and robust, with state-of-the-art automatic movements capable of withstanding the rigors of high-pressure environments. 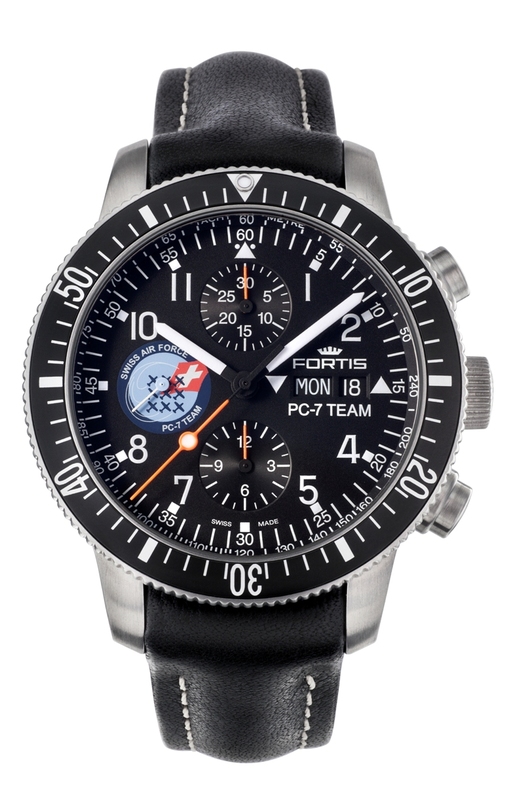 Today more than 60 flight squadrons worldwide choose Fortis Aviatis watches. Pilots trust them, and so should you. Space was just another frontier for Fortis to conquer – and it did – starting in the 1960s. 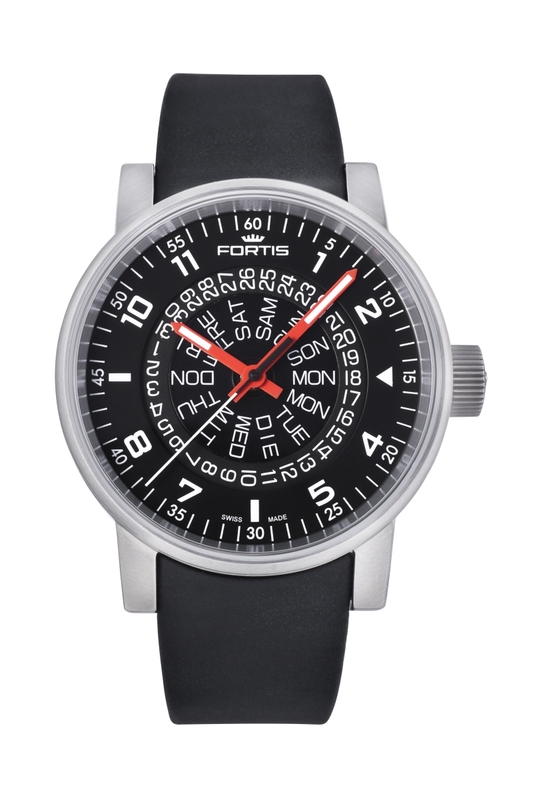 In the ’90s Fortis watches found a permanent place on the wrists of space travelers. 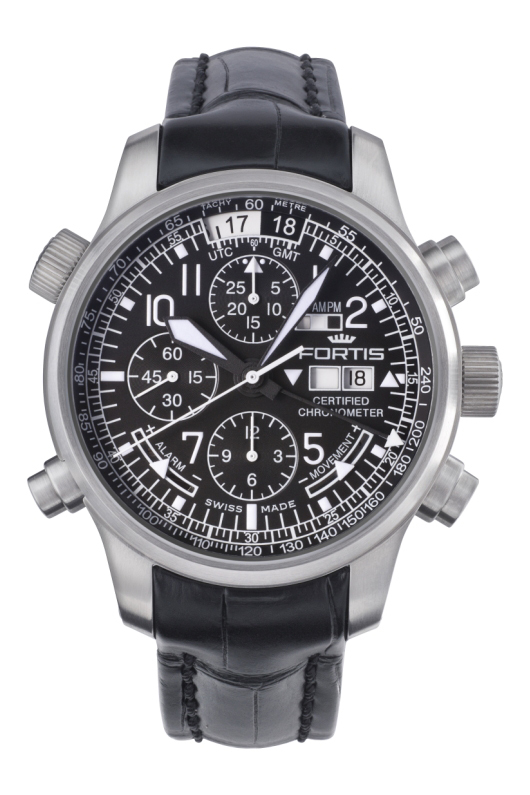 Since then, Fortis Official Cosmonauts watches have made 100,000 plus orbits of the earth aboard the space station MIR. The crown jewel in the collection is the Official Cosmonauts Chronograph, having proven itself time and time again far above the earth’s atmosphere and here on earth, where its outstanding functionality and resilient, solid frame prove valuable in any conditions. The Fortis Cosmonautis collection continues to write itself into the record books, and into the heart and minds of astronauts and enthusiasts everywhere. 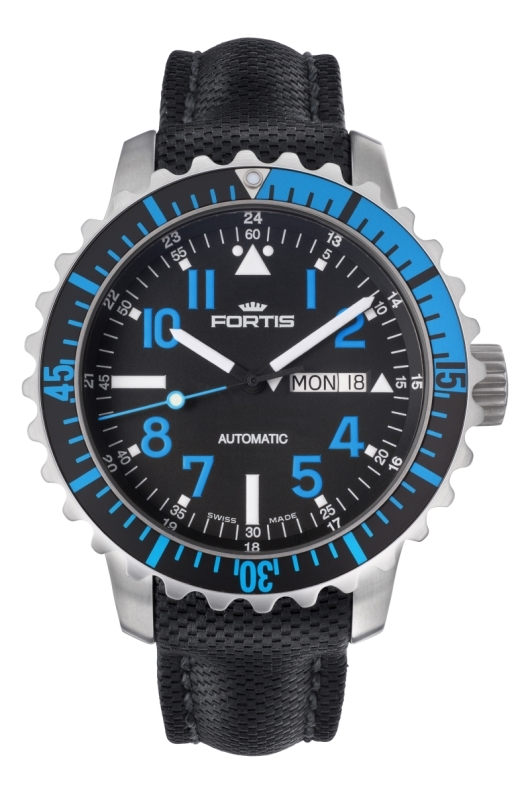 Before soaring into the worlds of flight and space travel, Fortis dominated the sea. 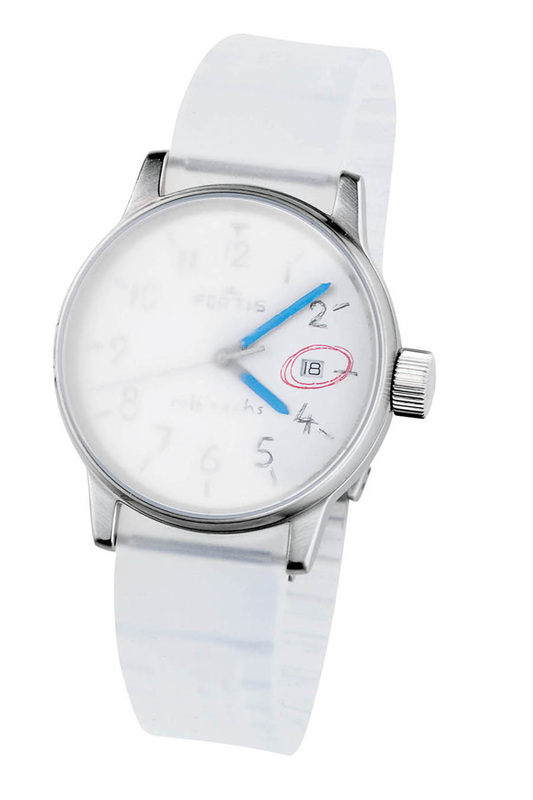 It began with the release of the Fortissimo in 1943 – the first water-resistant watch. Other brands followed suit and water resistance quickly became an important and practical aspect of watch design. The most famous Fortis Aquatis watch is the Marinemaster, which originally appeared in the 1940s. 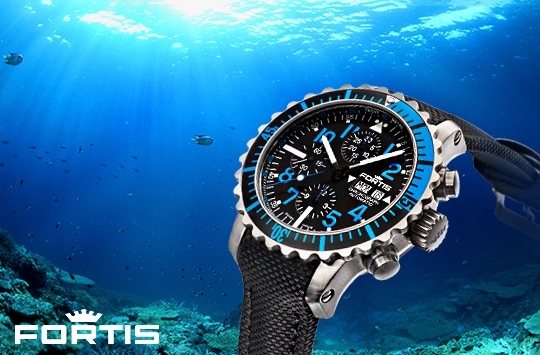 Today, the revamped and reinforced Marinemaster series is the centerpiece of the Aquatis collection. These highly legible and durable sport watches are water resistant to 660 feet and feature unidirectional turning bezels. They also come in several color combinations, proving that tool watches can be both durable and stylish. 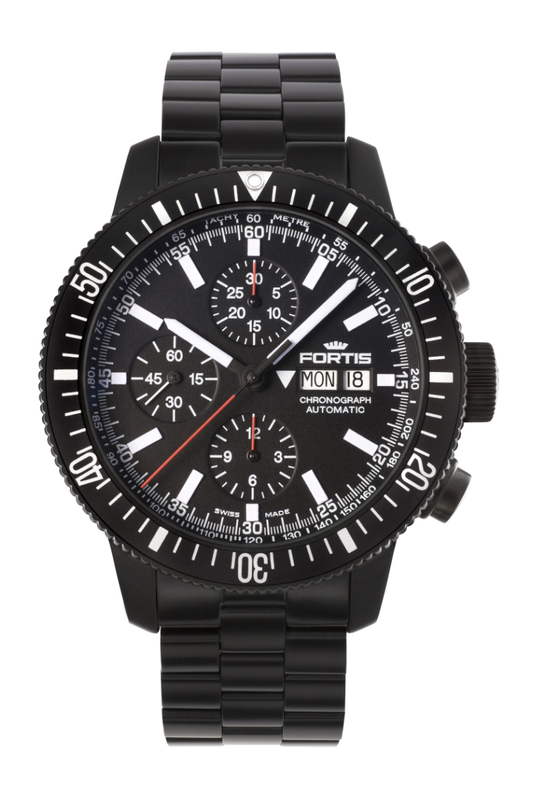 In space, in the sky and at sea, Fortis makes watches for people who are serious about life’s adventures. In 2015 Fortis added a fourth pillar – land – with the introduction of its new Terrestis collection. The look of these watches is inspired by Fortis watch designs of the 1930s and ’40s – designs that reveal the brand’s heritage in the most graceful way. But Terrestis watches aren’t merely nostalgic; models such as the Tycoon, Hedonist and 19Fortis prove that functionality, state-of-the-art mechanics and elegance need not be mutually exclusive. 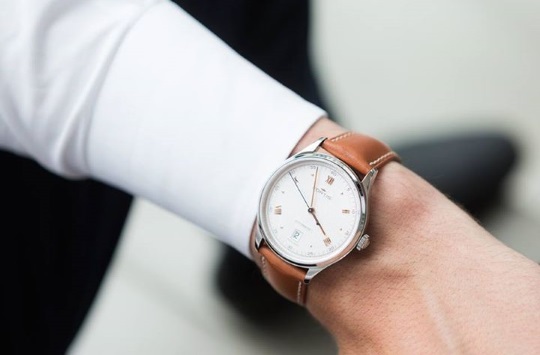 Terrestis watches are sophisticated, symmetrical and embrace watchmaking artistry with the inclusion of gold cases, patterned leathers and traditional decorations – because even an explorer needs a fine dress watch. The next frontier for Fortis may be the limits of imagination. 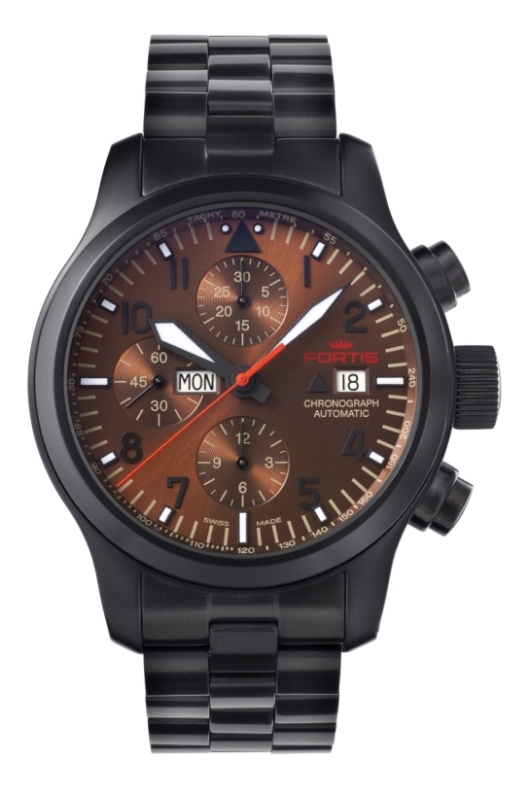 Under the direction of Fortis Swiss Watches Director Max Peter, the brand continues to foster a true collaborative spirit, partnering with progressive companies such as Volkswagen to design the award-winning Spaceleader Chronograph and with artists such as Rolf Sachs, who created the 2012 limited edition Frisson watch in the Art Edition Collection. Limited to 999 pieces, the crystal on the Frisson appears frosted until it comes in contact with moisture and becomes clear. 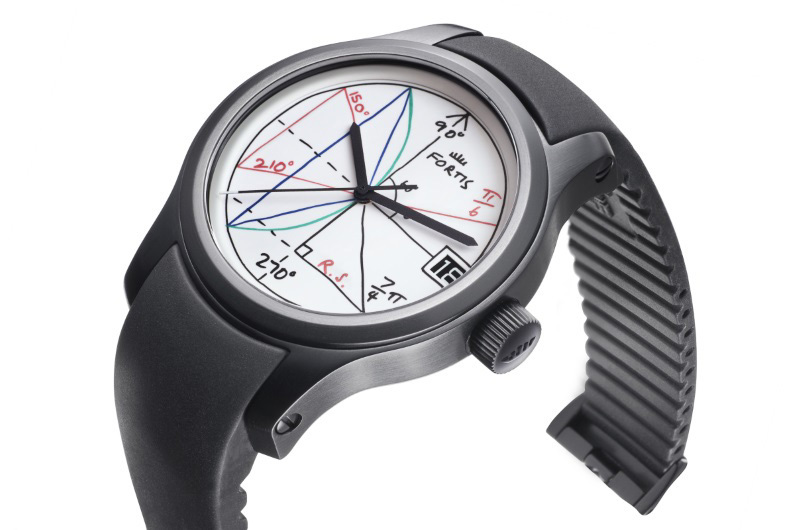 The latest art watch from Fortis, known as the 2pi, is also the result of a successful partnership with Rolf Sachs. With a fascinating dial that is reminiscent of something you would see on a white board in math class, the 2pi by Rolf Sachs is every math lover’s dream. 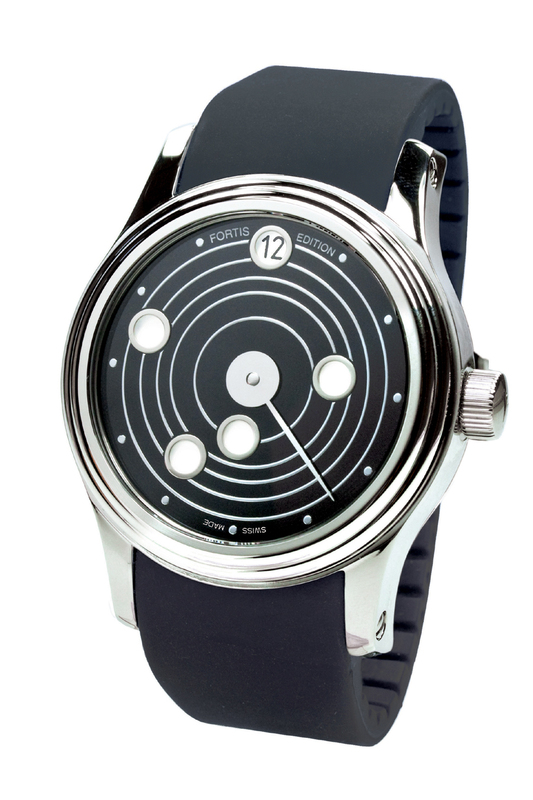 If you’re equally as passionate about math as you are about horology, this timepiece has your name on it. Fortis watches have traveled a long way. The 100-year-old, family-owned company has done it with an ever-forward view to the future. 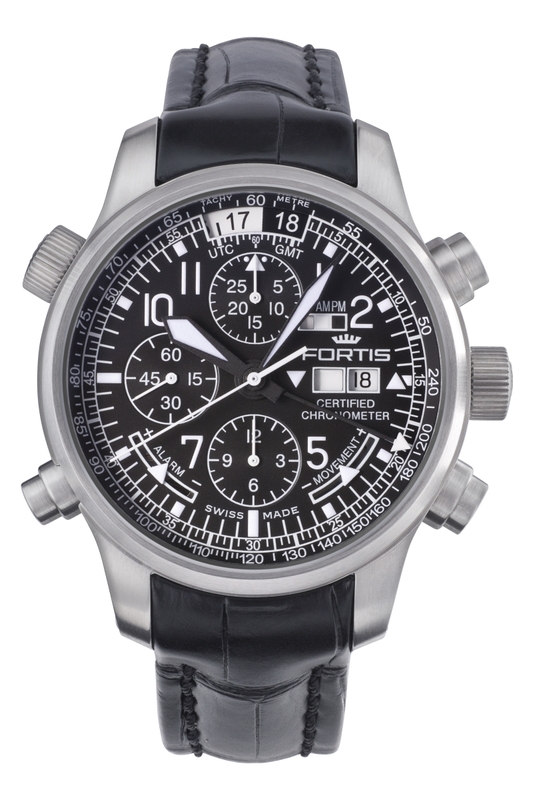 Now, more than ever, Fortis has global appeal for collectors, enthusiasts and astronauts alike. Find a Fortis dealer near you and discover where Fortis can take you. 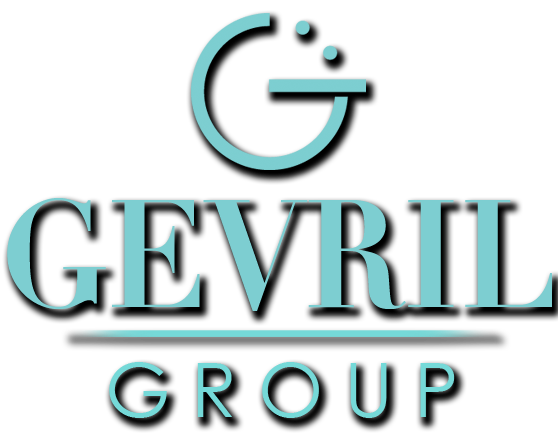 Gevril Group is an agent for Fortis Watches and the a Fortis watch maintenance and repair service center. Contact Miriam Tress, Fortis Brand Manager, by email or by calling 845-425-9882.